KANSAS CITY, Kan. — Are you a Christian? That makes you an evangelist, said Emily Lopez, the new archdiocesan lead consultant for adult evangelization. This can be a new — and somewhat overwhelming — idea for many Catholics. But before you let that “overwhelmed” feeling get very far, Lopez wants you to know something else: Success doesn’t entirely depend on you. Lopez, her husband David, and their five children belong to Curé of Ars Parish in Leawood. She assumed her position on Sept. 19, succeeding Father Andrew Strobl, who became pastor of the new St. John Paul II Parish in Olathe. Previously, Lopez had been director of religious education at Curé of Ars. Trusting the Holy Spirit, rather than relying on her own plans and will, led to a “reconversion” to the Catholic faith and, ultimately, her own role as an evangelist. It did not happen overnight, nor was the path direct. Lopez was raised about 20 miles west of Salina and attended Catholic grade school and Catholic junior and senior high school. Her mother laid the foundations of her faith. Lopez entered Benedictine College in Atchison in 1996. She was little involved with campus ministry, but was part of student government. She graduated in 2000 with a bachelor’s degree in history and minors in pre-law and psychology. While in school, she had a “grand plan” for her life — she’d do some volunteer work, go to law school and become a high-powered corporate attorney. Instead, she and David — who also attended Benedictine — chose marriage and a family. “My reconversion to the faith was all part of that period of my life — [recognizing that] this ‘grand plan’ for my life wasn’t going to happen,’” said Lopez. The key to it all was accepting God’s plan for her life, which included a large and growing family. 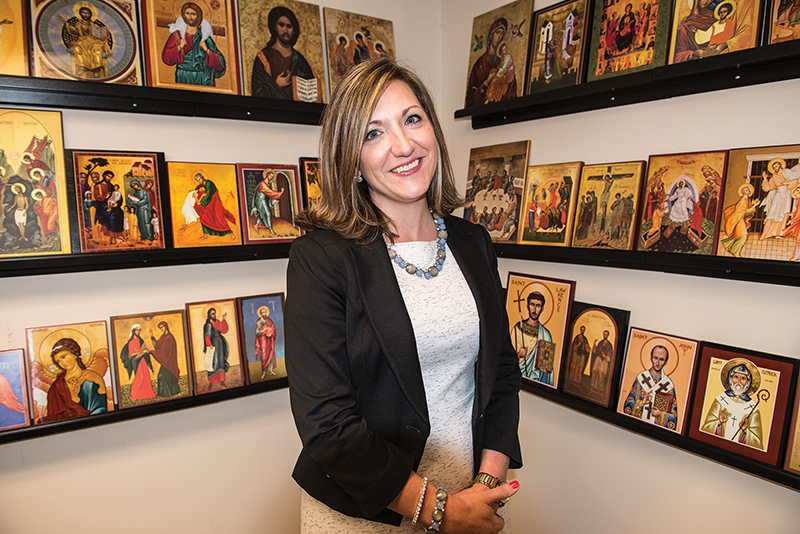 While a stay-at-home mom, she found time to volunteer in the Catechesis of the Good Shepherd program at Curé. One day, the director of religious education asked her what she’d like to do. “Work in the church . . . maybe become a director of religious education,” answered Lopez. It just so happened that the then-director had been praying for a replacement. Then- pastor Msgr. Charles McGlinn appointed Lopez DRE, and she served for three years. During that time, Lopez got to know Deacon Dana Nearmyer. When the archdiocesan office of evangelization reorganized and Father Strobl was assigned a parish, Deacon Nearmyer approached Lopez and encouraged her to apply for the position. The major focus of the archdiocesan office of evangelization is implementing the part of Archbishop Naumann’s 10-year mutually shared vision that relates to evangelization. An increasing priority on evangelization at the parish level led to the creation of four benchmarks — prayer, planning, hospitality and culture — to serve as tools in assessing a parish’s efforts. During the priests’ convocation this past September, pastors were invited to pilot this initiative with the hope of working with one parish in each of the eight archdiocesan pastoral regions. Lopez is now meeting with pastors of the pilot parishes to talk with them about the their parish identity, their vision, their parish’s strengths and weaknesses, and how they see evangelization being improved in their community. If evangelization is going to be successful, it must happen in the parishes.